Graeme Souness thinks Liverpool's front three are reminiscent of Barcelona at their best. The Reds made it five wins from five in the Premier League this season with a 2-1 victory at Tottenham on Saturday. Roberto Firmino scored Liverpool's second goal while Mohamed Salah and Sadio Mane were both influential and were praised for their work-rate by Souness. "You go back to Barcelona at their very best, you sat back and enjoyed their passing and moving football with their magicians like (Lionel) Messi and (Andres) Iniesta and Xavi - but it was easy to overlook their work-rate," former Liverpool captain Souness told Sky Sports. "It's the same with this Liverpool team. You admire the goals and creativity but can overlook the intensity they play with when they don't have the ball. If they can keep it going, whoever finishes in front of them this season will win the league. "The front three put the ball under pressure every minute. They nick the ball high up the pitch, they hunt in packs and they all know what they are doing. "They are all a goal threat but in this game they showed another side and worked their socks off. You can say Tottenham didn't play well but a fundamental reason for that is they weren't given any time and space to play." Former Liverpool and Tottenham striker Robbie Keane agreed with Souness, saying: "They are defending like it's a cup final. That comes from the manager because he is on them all the time to work hard. They won the game with their work-rate. "There is no doubt in my mind that either this year or next year Liverpool will win the league, the FA Cup or Champions League. The stature of Liverpool means they want to win trophies. The fans demand it and the manager demands it more than anybody." Souness also reaffirmed his midweek statement that he thinks this is the best Liverpool since the title-winning side in 1990. "This is the best Liverpool team since they won the league," he said. "I think they've got a great chance to win the league. 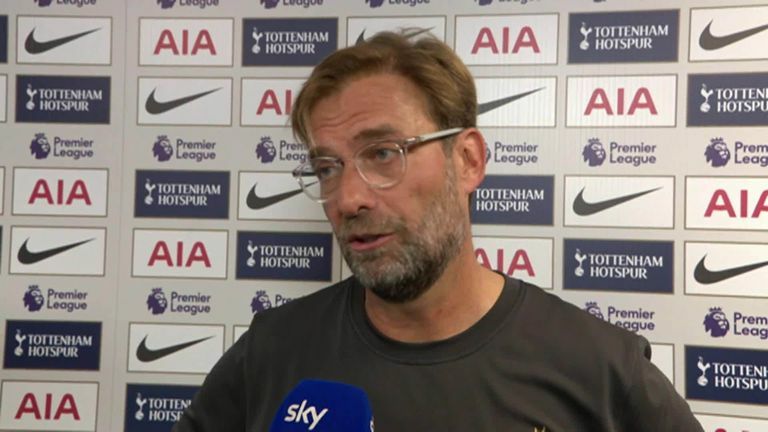 City are fabulous, they've got equally fabulous players, and I think it'll be nip and tuck all the way through if that's the intensity Liverpool can play with."